Subscribe visitors to a MailChimp list with Formidable for your MailChimp signup form. When a form is submitted, automatically add or auto update subscriber information. Please note, you must have a MailChimp account in order to use the MailChimp add-on. In your WordPress admin, go to 'Formidable' → 'Add-Ons' and click the 'Install' button for the MailChimp WordPress plugin. Now that the MailChimp plugin is activated you’ll need to set up a MailChimp signup form. Follow the steps below to integrate Formidable Forms with your MailChimp account. Now that the plugin is activated, go to 'Formidable' → 'Global Settings' and click the 'MailChimp' tab. Insert your MailChimp API Key. You can find your API key by logging into your MailChimp account, and going to 'Account' → 'Extras' → 'API Keys'. Click 'Create A Key' if you don't have one set up already. Go into the form which you will be using to subscribe users to a mailing list. Click on 'Settings' → 'Form Actions' → 'Add to MailChimp'. Select the MailChimp list that you would like to add subscribers to. Select the Email Address, and any other required options. The options that show up here are determined in your MailChimp list's settings. Opt in: If you would like to add the user's email address to the mailing list automatically, select 'Single'. Select 'Double' if you would like the user to confirm their subscription prior to being added to the mailing list. Trigger this action after: Select 'Create' if you would like the user to be added to the mailing list when they submit the form. Select 'Create' and 'Update' if you would like to update the user's details in the mailing list when his/her entry is updated. 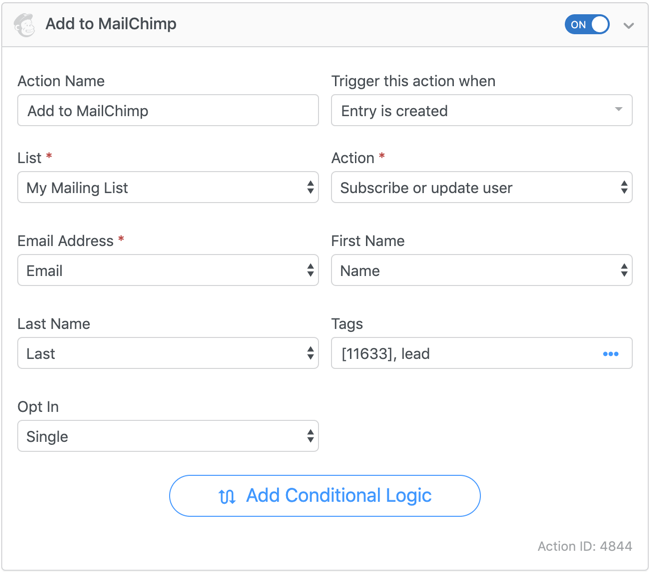 Conditional logic can be used to add a user to the mailing list only if specific conditions are met. Please note that Conditional Logic is only available in the Pro version of Formidable Forms. Note: MailChimp will not add email addresses that look fake (such as john@example.com) to a mailing list. Set up a group through your MailChimp account. Follow the steps here to do that. Once you have set up a group in MailChimp, go into your form and add a field for the group. Make sure you add a 'Checkbox', 'Radio Buttons', or 'Dropdown' field to match the field you chose when setting up a group list in your MailChimp account. If you don't want this field to be seen, you can select a default value and set the field visibility to administrator. Go to your form 'Settings' → 'Form Actions' → 'Add to MailChimp'. Select the MailChimp list that you would like to add subscribers to. Select the Email Address and any other required options. If your MailChimp group was set up correctly, it will appear as an option. In this example, the group is 'Fresh Foods Market'. Match up the group with the field that you created in Step 2. Set up all options inside the group as well. If you would like to pass a phone number from a Formidable form to MailChimp, please follow the instructions below. 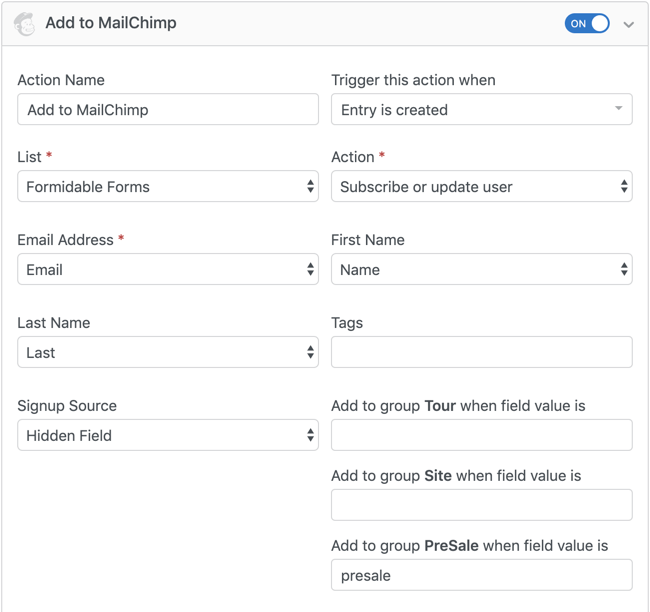 Set up a Phone field in your MailChimp list. Follow the steps here to do that. Once you have set up a Phone Number field in your MailChimp list, go into your form and add a Phone Number field. If you selected (999)999-999 for the phone format in MailChimp, put 999-999-9999 in the Format box. If you selected International for the phone format in MailChimp, you may use any format in the Phone Number field. Go to your form 'Settings' → 'Form Actions' and open your MailChimp action. If you have not created one, you may create a MailChimp action now. Map the Phone option in the MailChimp action to the Phone Number field in your form. These code examples can be added to the 'Code Snippets' plugin (recommended) or a child theme's functions.php file. Replace 12 with the ID of your form. Replace 150 with the ID of the field where the email type is selected. After you set up your form action with the instructions above, new subscribers should be added to your MailChimp list. If they are not, start with these steps. Turn on double opt-in in the MailChimp signup form action settings. Then submit the form with an email address you have never used before with MailChimp. If you receive the email, you should be good to go and new subscribers will be added. Check your spam email too if you don't see it. If you do not receive the email, check the conditional logic settings in your form action. If you have conditional logic there, remove it and submit the form again. If you receive the email, adjust your conditional logic to trigger the subscription at the correct time. Still no email? Check the MailChimp API log for clues. This can be found in your MailChimp account. Go to Account → Extras → API Keys and scroll all the way to the bottom to the 'Last 24 hours of API calls'. 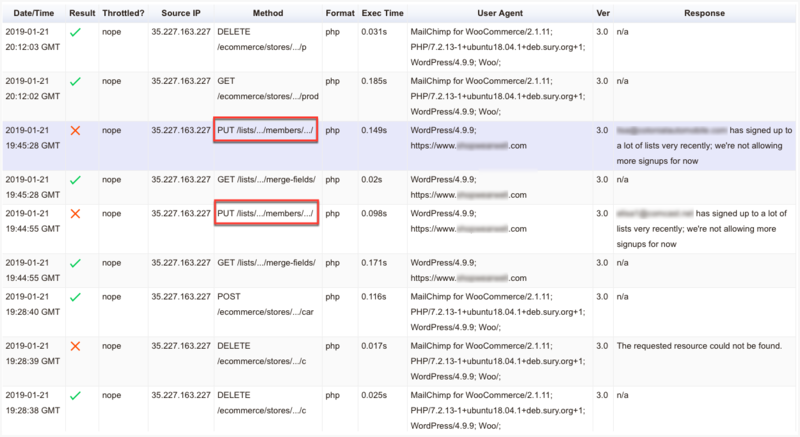 You should see your API calls listed here, along with a reason why they are failing. Formidable calls will generally be under PUT lists/../members/ in the Method column. Here are some examples of error responses that you might encounter. name@example.com has signed up to a lot of lists very recently; we're not allowing more signups for now. If you are seeing this response, then those email addresses might have subscribed to too many lists that's why it's being blocked by MailChimp. name@gmail.com was permanently deleted and cannot be re-imported. The contact must re-subscribe to get back on the list. If you are seeing this response, then the email address you're attempting to use may not be permitted by your Mailchimp account. You can try testing other email addresses and check Mailchimp to see if it was successfully added to your "All Records" list. GDPR field enabled lists are not yet supported by this plugin. To prevent this issue, lists can not be GDPR enabled at this time.